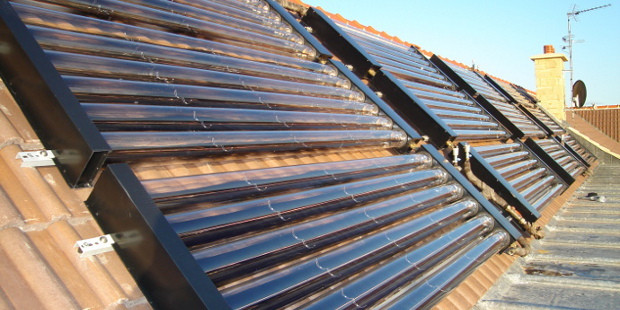 Solar thermal systems harnessed energy from the sun to provide domestic hot water. These systems do not generally provide space heating (although they can). In a typical system, a heat transfer medium (generally a water/antifreeze mixture) travels through a series of heat conducting tubes known as a heat collector. During its circulation through the tubes, the fluid picks up heat which is then transferred to the domestic hot water supply as it passes through a coil in an appropriate storage cylinder. Commercially available systems are either indirect (closed loop) or direct (open loop). With the more common indirect system, circulating fluid flows through the collector and transfers the heat to a hot water tank. Assistance with registration for renewable heat incentive or equivalent. R&D projects on the integration of solar thermal with heat pumps or combi boilers.